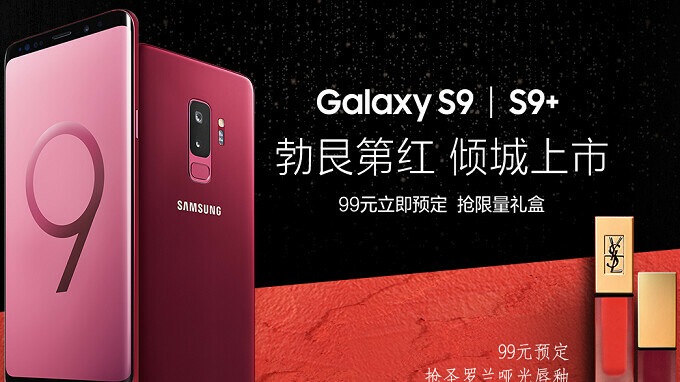 A new burgundy red color option for the Samsung Galaxy S9 and Samsung Galaxy S9+ has been listed on the Samsung China website. While not yet available, adding new colors to its flagship line is not new for Samsung; what is concerning is that this was done earlier than usual and might indicate that sales of Sammy's 2018 flagship phones are flagging. The phones were launched in March and Samsung usually waits longer before adding additional color choices to its flagship line. It is unknown whether this new color will be available only in China. Last year, the same color option was added to the Samsung Galaxy S8 and Samsung Galaxy S8+ in South Korea and India. Rose pink versions of the pair were offered in Taiwan, the U.K., and South Korea. The manufacturer has signed three Chinese celebrities to hawk the new color, and buyers will receive a tube of matching red Yves Saint Laurent lipstick. Pricing is expected to remain the same. The current color choices in China for the handsets include black, purple, and blue. Global smartphone shipments declined 2.9% in the first quarter as the market remains cool. While Samsung shipped 8 million units of its 2018 flagship phones during the first month of availability, overall it shipped 1.9 million fewer smartphones from January through March. Please bring back emerald green Sammy!